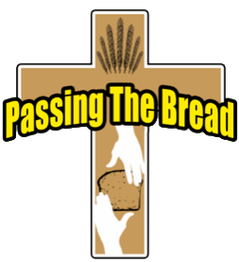 Passing the Bread (PTB) was initiated by community leaders, concerned citizens, and several local churches during the recession of 2008. 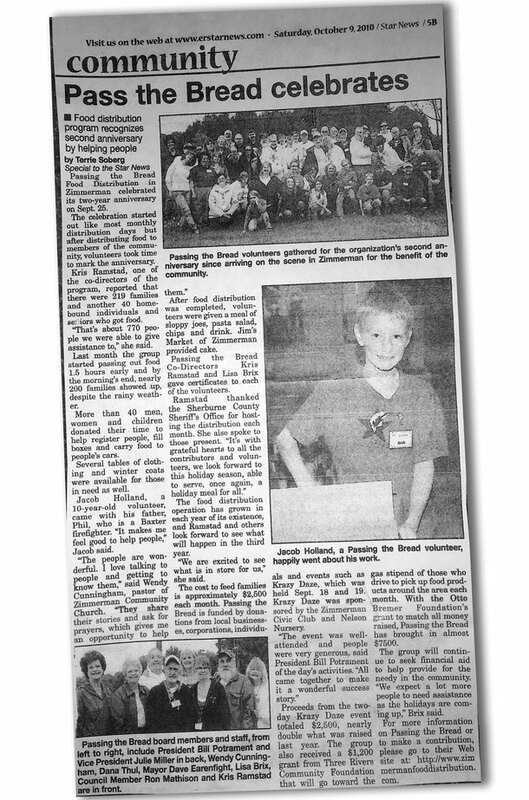 With donations from several different sources and a number of local volunteers, the first food distribution was held in May of 2008 at Christ Our Light Catholic Church at the Zimmerman campus, with overwhelming response. Monthly distributions continued at a variety of different sites in the area including the Sherburne County Public Safety building. Today, through a generous donation, PTB calls the UMA Precision Machining building a permanent distribution site. Representatives from Bremer Bank offered a lower level storage space at the Zimmerman location in the earlier years. With the closing of the Zimmerman Bremer Bank location, food storage was moved to another local Zimmerman business. Distributions have continued to be held on the last Saturday of each month, with few exceptions. As time went on, food to residents in urgent need and delivery to residents who are homebound were added and are currently available upon request. Since its initial beginnings, Passing the Bread has become a 501(c)3 nonprofit charity organization registered with the State of Minnesota and has continued to offer perishable and nonperishable food to needy residents in the Zimmerman and Princeton area. Passing the Bread is an agency partner with Second Harvest Heartland which allows food purchases at a significantly reduced rate. Funding sources include food and monetary donations from individuals and businesses in the area, from grants and fundraisers, and from philanthropic organizations. The organization is governed by a volunteer board of directors who regularly meet to review, plan, and develop new strategies to maintain the organization efficiently. Passing the Bread has many faithful volunteers from the local communities who assist in transporting food, setting up distributions, and helping with various other tasks.